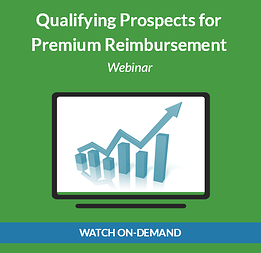 Free Webinar on Qualifying Prospects for Premium Reimbursement Now Available On-Demand! This week, Zane Benefits' JD Cleary discussed "Qualifying Prospects for Premium Reimbursement?" via webcast. The feedback has been outstanding, so we've made a recording available to everyone. As discussed during the webinar, small and medium sized companies are rapidly adopting individual health insurance and premium reimbursement to offer more affordable and sustainable health benefits. What types of companies benefit the most from this new solution, and how can your business benefit? The new 35-minute on-demand webinar helps insurance professionals and CPAs understand: the ideal customer for premium reimbursement, how to find and qualify prospects, ways to retain existing clients, and how to grow your business by offering a premium reimbursement solution.